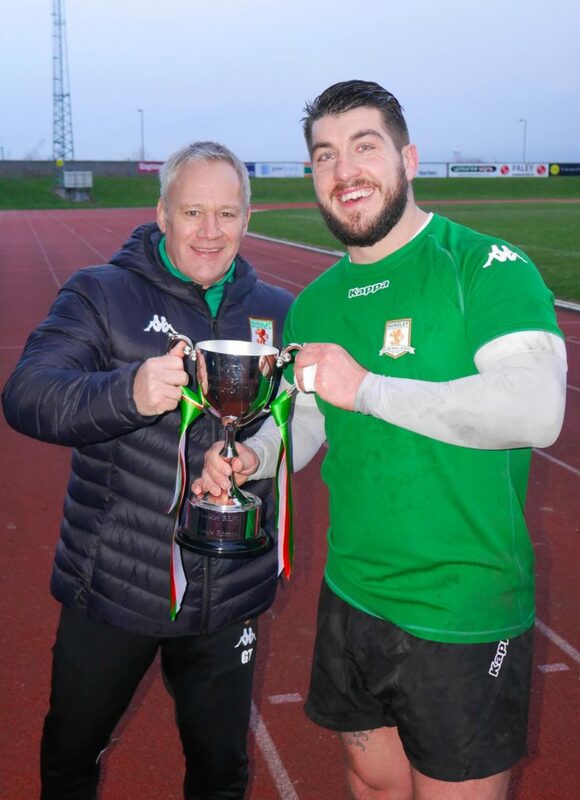 Hunslet won the annual Harry Jepson OBE Memorial Trophy (3 February 2019) at the South Leeds Stadium against a young Leeds Rhinos for the second year in succession. Leeds, who were fielding a relatively unknown side snapped at the hosts heels, but Hunslet, still finding their feet with plenty of new faces were always in control. The game was only called on at 1pm after a pitch inspection and gladly so, as the teams produced a try fest in cold conditions. Hunslet had the early pressure, but Leeds were first to score when impressive Jack Broadbent took an interception to race a full 90 yards. The home side hit back moments later when from a scrum Fullback Reece Dean edged over in the corner. No conversion though left Leeds leading 4-6. Scrum half Danny Nicklas was impressive early on for Hunslet and edged them in front on 12 minutes feeding off an Adam Robinson burst to dive under the posts. 10-6. Leeds got back on level terms on 25 minutes when after a kick and scramble Liam Tindall went over for the visitors. Hunslet from this point started to look the more likely with Richard Moore and Josh Tonks powering them forward, and after another Reece Dean break down the left Dale Bloomfield scored in the corner 16-10. More pressure, and close to the break Man of the Half Reece Dean notched up his brace of tries with a try built on a Josh Tonks break. Hunslet looking strong now, especially on the left meant Leeds had some thinking to do at the break. Half Time Hunslet RLFC 22 Leeds Rhinos 10. The second half kicked off with Leeds needing to find some inspiration, and when Hunslet’s impressive full-back Reece Dean was sin-binned for a high tackle it looked like they may have found it, starting to come more into the game. But it was Hunslet that scored next when on 55 minutes Zac Braham dived over from a sleek Richard Moore pass. Hunslet lead 28-10 and it looked ominous for the visitors. But young players never give in and Leeds were handed a lifeline with a strange try on 65 minutes. The Hunslet defence seemed to stop and wait for the referee’s whistle, but it never came and Leeds’ Iwan Stephens ran 50 yards for a try. Five minutes later Broadbent scored a good try down the left to reduce the arrears to 6 points. Hunslet leading 28-22. Home nerves were calmed a minute later after Leeds committed the cardinal sin of knocking on from the kick off. Josh Tonks, a real plus for Hunslet this season spun out of the tackle and scored to give Hunslet that crucial 2 try lead. 34-22. A late Callum McLelland try for the visitors made it interesting, and on the hooter Leeds had one play to get a draw, but the bomb was diffused and Hunslet deservedly had the victory. All in all a good day at the office for Gary Thornton. Some of his new signings shone, although he will be disappointed at some of the tries given away. A crowd of 510 is disappointing for the calibre of Rugby on show, but hopefully as the season progresses and the wins start coming the crowds will flock back. As for Leeds, some good prospects for the future and a good bit of experience for a young team. Hunslet RLFC: Reece Dean, Gareth Potts, Nathan Chappell, Conor McGrath, Dale Bloomfield, Joe Sanderson, Daniel Nicklas, Richard Moore, Vila Halafihi, Adam Robinson, Duane Straugheir, Josh Tonks, Michael Emmett. Interchange: Zach Braham, Curtis Davis, Marcus Webb, Jordan Syme, Ryan Wright, Daniel Hawksworth, Aiden Hema. Head Coach GT and Club Captain Duane Straugheir lift the cup.